Posted on Thu, Mar 15, 2012 : 8 a.m.
Today is the infamous Ides of March. Julius Caesar was murdered by a group of conspirators on this day, March 15, in the year 44 B.C. An article on NationalGeographic.com notes that, "For ancient Romans living before that event ... an ides was merely one of several common calendar terms used to mark monthly lunar events. The ides simply marked the appearance of the full moon." But after the assassination, "The phrase came to represent a specific day of abrupt change that set off a ripple of repercussions throughout Roman society and beyond." To commemorate this day, it's necessary to serve something not just Italian but specifically Roman. Italians are very regional in their cuisine, with laws requiring "truth in advertising," so to speak, to denote that a particular item was indeed produced in a precise area and that it meets clearly-defined standards. The concept of "Italian food" is anathema; there is only the cuisine of Emilia-Romagna or Abruzzo or Calabria. And these regions are still further localized, as shown, for example, by the famous ragu Bolognese from the city of Bologna within Emilia-Romagna. These are very serious matters, you know! Respect must be shown! Thus, today's dish is not merely "Italian Sweet-and-Sour Onions," Dio non voglia! (God forbid!) 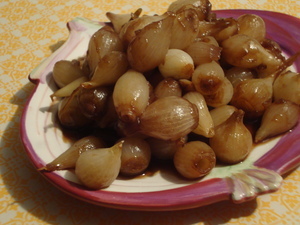 It is Cipollini in Agrododolce alla Romana [chee-poh-LEE-nee in ahg-roh-DOHL-chay ah-lah roh-MAH-nah], otherwise known as Baby Onions in Sweet-and-Sour Sauce in the Roman style. What, precisely, makes this a Roman recipe? It's "Easy to make, good for you, gutsy, flavorful and fun to eat," according to cookbook author David Downie. Since "all roads lead to Rome," as the saying goes, Roman food incorporates ingredients from many surrounding areas; and yet, it retains distinctive traditions and taste combinations, such as the sweet-and-sour offering below. Roman cooking is noted for its simplicity, letting top-quality ingredients shine with a minimum of preparation. Cucina povera — poor people's food — survived many sieges and battles, as Romans ate what could easily be grown in even harsh conditions. In Shakespeare's Julius Caesar, the title character was warned to "Beware the Ides of March." But there is no need to be wary of this recipe for onions that are served at trattorie (bistros) throughout Rome. While traditionally this is an appetizer, it's a very simple, aromatic, and delicious dish that would be an ideal accompaniment to many entrees. In the same saucepan, heat the oil over medium heat; add the garlic and sautÃ© just until starting to color. Add the onions back into the saucepan; add the remaining ingredients. Bring to a boil, then turn heat to "low;" cook for 20-25 minutes, stirring once halfway through, until the onions are fork-tender and most of the liquid has evaporated.